The most frequent question I get asked from Massage Therapists is "can I use the same products I use on my clients body on their face?" Although there are a few products that can be used on both the body and face, 90% of the time the answer is NO! If you think about it, do you wash your body with the same products you wash your face with? Do you use the same lotion or cream on your body as you do your on face? I'm going to assume that you answered no to both those questions, and I think if you're in this business you know exactly why you did. There are many reasons why you should not use a product made for the body on the face. Your face is more sensitive, more prone to irritation and it is much more noticeable when irritation occurs. I don't think any client would be happy leaving a fabulous massage to come home and see that their face did not enjoy it as much as their body did. Massage Oils Can Be Too Heavy for Delicate Facial Skin. When a client comes in for a service, they are hoping to unwind, relax and be pampered, not end up with clogged pores and irritated skin. If your client leaves your hands with a skin issue caused by product that should not have been used, it will not only be a problem for them but you as well. Most clients won't even notice if you are using the same products on their face and body, until it's too late. How can you prevent this irreversible mistake? Make your clients aware before someone else does! By telling your client that you are going to use a different oil and cream or lotion on their face, they will wonder why no one has offered this before. This little extra step will make your clients feel that you are knowledgeable in your craft and concerned with their face, body, skin and overall well being. Create A Special Experience For Your Clients. 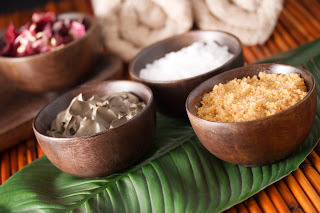 Pure Spa Direct offers many products that allow you to provide the services your clients expect and appreciate. We even carry entire product lines specializing in facial massage oils, lotions and creams that target different skin types. By providing your clients the choice of oil and lotions or creams specific to their skin type, you are giving them that extra attention that the competition does not. By adding this extra little service, that is a minimal cost to you, your clients will feel that you have gone above and beyond and will surely come back and recommend you to others. This little extra addition provides the ability to offer comfort, ease and trust, just the little extra TLC that everyone wants and needs.